Among the numerous foreshadowings of Baptism in the Old Testament, some stand out because they are cited in the New Testament as explicitly connected to Baptism: the Flood, the crossing of the Red Sea, the rite of circumcision (see 1 Pet 3:20-21; 1 Cor 10:1; Col 2:11-12). Jesus was baptized in the waters of the Jordan at the beginning of his public ministry (see Mt 3:13-17), not because he needed it, but through solidarity with us. Water was thereby definitively indicated as the material element of the sacramental sign. In addition, the skies opened up, and the Holy Spirit came down in the form of a dove and the voice of God the Father testified to Christ's divine filiation. Thus we see in the Head of the future Church what was to take place sacramentally in his members. Later, in his meeting with Nicodemus, Jesus affirms the spiritual link between the waters of baptism and salvation, and testifies to its necessity: unless one is he born of water and the Spirit he cannot enter into the Kingdom of God (Jn 3:5). The paschal mystery is what gives Baptism its salvific value. Jesus “had already spoken of his Passion, which he was about to suffer in Jerusalem, as a 'Baptism' with which he had to be baptized (Mk 10:38; cf. Lk 12:50). The blood and water that flowed from the pierced side of the crucified Jesus are types of Baptism and the Eucharist, the sacraments of new life"( CCC , 1225). Before ascending to heaven, our Lord told the apostles: Go therefore and make disciples of all nations, baptizing them in the name of the Father and of the Son and of the Holy Spirit, teaching them to observe all that I have commanded you (Mt 28:19-20).Ever since Pentecost his command has been faithfully followed, signaling what continues to be the primary objective of evangelization. We read in Rom 6:3-4: Do you not know that all of us who have been baptized into Jesus Christ have been baptized into his death? We were buried therefore with him by baptism into death, so that as Christ was raised from the dead by the glory of the Father, we too might walk in newness of life. Baptism reproduces in the faithful Jesus' passage on earth and his saving action, conferring justification on the Christian. As Col 2:12 says, you were buried with him in baptism, in which you were also raised with him through faith in the working of God, who raised him from the dead. We see here the need for faith, which, together with the rite of water, “clothes us in Christ," as Gal 3:26-27 tells us: for in Christ Jesus you are all sons of God through faith. For as many of you as were baptized into Christ have put on Christ . This reality of justification brought about by Baptism produces specific effects in the Christian's soul, which theology calls “healing" and “elevating" effects. The first refer to the pardon of sins, as the teaching of St. Peter stressed: And Peter said to them, 'Repent and be baptized every one of you in the name of Jesus Christ for the forgiveness of your sins, and you shall receive the gift of the Holy Spirit' (Acts 2:38). This forgiveness includes original sin and, in adults, all personal sins. In addition, all temporal and eternal punishment is remitted. Nevertheless “certain temporal consequences of sin remain in the baptized, such as suffering, illness, death, and such frailties inherent in life as weakness of character, and so on, as well as an inclination to sin that Tradition calls concupiscence , or metaphorically, 'the tinder for sin' ( fomes peccati )" ( CCC, 1264). The elevating aspect comes from the infusion of the Holy Spirit, for by the one Spirit we were all baptized (1 Cor 12:13). And since this is the same Spirit of Christ (Rom 8:9), we receive the spirit of adopted children (Rom. 8:15), as sons and daughters in the Son. God confers on the baptized sanctifying grace, the theological and moral virtues and the gifts of the Holy Spirit. Moreover, “Baptism seals the Christian with the indelible spiritual mark ( character ) of his belonging to Christ. No sin can erase this mark, even if sin prevents Baptism from bearing the fruits of salvation. Given once for all, Baptism cannot be repeated" ( CCC, 1272). Since we were baptized in the one Spirit into one body (1 Cor 12:13), incorporation into Christ is at the same time incorporation into the Church, and in her we are linked to all Christians, including those who are not in full communion with the Catholic Church. We recall, finally, that the baptized are a chosen race, a royal priesthood, a holy nations, God's own people, that you may declare the wonderful deeds of him who called you out of darkness into his marvelous light (1 Pet 2:9).Thus they share in the common priesthood of the faithful, and so “'must profess before men the faith they have received from God through the Church' ( LG , 11), and participate in the apostolic and missionary activity of the People of God" ( CCC , 1270). The New Testament categorically teaches regarding Christ that there is no other name under heaven given to men by which we may be saved (Acts 4:12).And since being “baptized in Christ" means being “clothed in Christ" (cf. Gal. 3:27), we can grasp the full force of Jesus' words when he says, he who believes and is baptized will be saved; he who does not believe will be condemned (Mk 16:16). This is the source of the Church's faith regarding the necessity of Baptism for salvation. This last statement must be understood according to the careful formulation of the Magisterium: “Baptism is necessary for salvation for those to whom the Gospel has been proclaimed and who have had the possibility of asking for this sacrament (see Mk 16:16). The Church does not know of any means other than Baptism that assures entry into eternal beatitude; this is why she takes care not to neglect the mission she has received from the Lord to see that all who can be baptized are 'reborn of water and the Spirit.' God has bound salvation to the sacrament of Baptism, but he himself is not bound by his sacraments " ( CCC , 1257). There are, in practice, special situations in which the principle fruits of Baptism can be obtained without the intervention of the sacrament. However, precisely because there is no sacramental sign, there can be no certainly of the grace conferred. What the Church traditionally calls baptism of blood and baptism of desire are not “received acts," but rather a collection of circumstances affecting a particular person, making it possible to speak about salvation. As the Catechism states, “the Church has always held the firm conviction that those who suffer death for the sake of the faith without having received Baptism are baptized by their death for and with Christ" ( CCC , 1258). Similarly,the Church teaches that “every man who is ignorant of the Gospel of Christ and of his Church, but seeks the truth and does the will of God in accordance with his understanding of it, can be saved. It may be supposed that such persons would have desired Baptism explicitly if they had known of its necessity" ( CCC , 1260). The situations of baptism by blood and baptism by desire do not cover the case of children who die before Baptism. 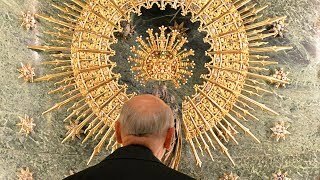 “The Church can only entrust them to the mercy of God, as she does in her funeral rites for them. Indeed, the great mercy of God who desires that all men should be saved (see 1 Tim. 2:4) . . . allows us to hope that there is a way of salvation for children who have died without Baptism" ( CCC 1261). The “rites of reception" have the purpose of carefully discerning the will of the candidates, or of the parents, to receive the sacrament and to take on its consequences. This is followed by readings from Scriptures that illustrate the baptismal mystery and are commented on in the homily. Then the intercession of the saints is invoked, in communion with whom the baptized person is soon to be placed. The prayer of exorcism and the anointing with the oil of the catechumens signify divine protection against the wiles of the evil one. Then the baptismal water is blessed with words that stress the close tie between water and the Spirit. Faith and conversion are stressed through the Trinitarian profession and the renouncing of Satan and sin. The sacramental phase of the rite then begins, through the bathing with water in the strength of the word (Eph 5:26). Whether done by immersion or by pouring, care should be taken that the water runs over the head, thus signifying the real washing of the soul. The valid matter for this sacrament is water, seen to be such according to people's common judgment. 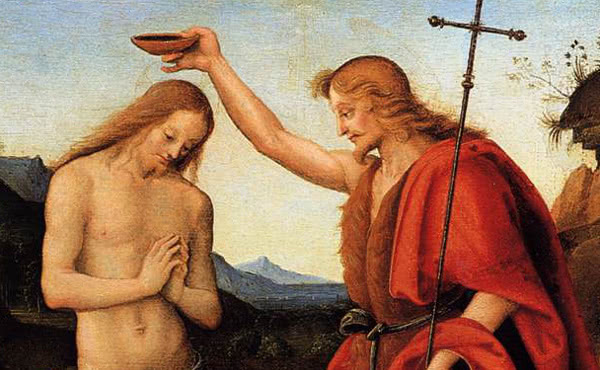 As the minister pours the water three times over the head of the candidate, or submerges the person, he pronounces the words “N., I baptize you in the name of the Father, and of the Son and of the Holy Spirit." The post-baptismal rites (or explanatory rites) illustrate the mystery that has been carried out. The head of the candidate is anointed with sacred chrism (unless Baptism is followed immediately by Confirmation), which signifies the gift of the Holy Spirit received by the newly baptized and the sharing in the common priesthood, as well as being a reminder of the future anointing that will take place in Confirmation. A white garment is given as an exhortation to conserve one's baptismal innocence and as a symbol of the new life that has been received. The candle, lit from the Easter candle and given to the newly baptized, symbolizes the light of Christ, and reminds them to live as children of the light. The rite of the effeta (from Christ's words “be opened"), on the ears and mouth of the newly baptized, signifies the attitude of listening to and proclaiming the word of God. Finally, the recitation of the Our Father before the altar (in the baptism of adults, this take place within the Eucharistic liturgy) expresses the baptized person's new condition as a child of God. The ordinary ministers are the bishop and priest and, in the Latin Church, also the deacon. In case of necessity, any man or woman can baptize, even if not a Christian, as long as they intend to do what the Church does when she baptizes. Baptism is intended for all men and women who have not yet received it. The qualities necessary in the candidate depend upon whether they are children or adults. A child who has not yet reached the age of reason should be baptized during the first days of its life, as soon as its health and that of the mother permit. To act otherwise, using a strong expression from St Josemaria, is “ to offend seriously against justice and against charity." Baptism, the gateway to the life of grace, is an absolutely gratuitous gift; for it to be valid all that is needed is that it should not be rejected. Moreover, the faith of the candidate, necessarily an ecclesial faith, is present in the faith of the Church. Nevertheless, certain limits exist regarding the practice of the Baptism of children. It is illicit if done without the consent of the parents, or without a sufficient guarantee that the child will be brought up a Catholic. This last point explains why godparents are needed, chosen for their exemplary life. Adult candidates are prepared through the catechumenate, structured according to local practice with a view to the candidate receiving the sacraments of Baptism, Confirmation and first Holy Communion at the same time. This period of preparation seeks to foster the person's desire for grace, which includes the intention of receiving the sacrament, and which is a condition for its validity. Candidates are also given doctrinal instruction, which step by step seeks to strengthen in them the supernatural virtue of faith and a true conversion of heart, which sometimes may demand radical changes in the person's life. 1. Biblical and historical foundations. The prophesies about the Messiah had announced that the spirit of the Lord shall rest on him (Is 11:2): Behold my servant whom I uphold, my chosen, in whom my soul delights; I have put my Spirit upon him, he will bring forth justice to the nations (Is 42:1) . The prophetic text is even more explicit when the Messiah himself speaks. The spirit of the Lord is upon me because the Lord has anointed me to bring good tidings to the afflicted (Is 61:1). Something similar is announced for the entire people of God: I will put my spirit within you and cause you to walk in my statutes (Ez 36:27). In Joel the universality of this outpouring is stressed: even on the slaves, men and women, I shall pour out my spirit in those days (Jl 3:23). In the mystery of the Incarnation the messianic prophecy is made a reality (see Lk 1:35), shown forth publicly in the anointing by the Jordon (see Lk 3:21-22), when the Holy Spirit descended on Christ in the form of a dove and the voice of the Father confirmed the prophecy of his election. Our Lord himself, at the beginning of his ministry, declares that he is the Lord's Anointed in whom the prophecies are being fulfilled (seeLk 4:18-10), and he lets himself be guided by the Spirit. (see Lk 4:1; 4:14; 10:21) right up to the moment of his death (see Heb 9:14). Before offering his life for us, Jesus promised to send us the Spirit (see Jn 14:16; 15:26; 15:13), as truly happened at Pentecost (see Acts 2:1-4), with explicit reference to the prophecy of Joel (see Acts 2:17-18) , thus beginning the universal mission of the Church. The same Spirit poured out on the apostles in Jerusalem is through them communicated to the baptized by the laying on of hands and prayer (see Acts 8:14-17; 19:6). This practice became so well known in the primitive Church that the Letter to the Hebrews testifies to it as part of the “elementary teaching" and “fundamental topics" (Heb 6:1-2). This biblical picture is completed by the teaching of both John and Paul, which highlights the “anointing" and “sealing" by the Spirit poured out on Christians (see 2 Cor 1:21-22; Eph 1:13; 1 Jn 2:20-27). This is given liturgical expression in the earliest documents, in the anointing of the candidate with perfumed oil. These same documents bear witness to the unity of the primitive rite of the three sacraments of initiation conferred during the paschal celebration presided over by the bishop in the cathedral. When Christianity began to spread outside the cities and the baptism of infants became generalized, it was no longer possible to follow the primitive practice. While in the Latin Church Confirmation was reserved to the bishop, separating it from Baptism, in the East the unity of the sacraments of initiation was preserved, given simultaneously to the new-born child by the priest. Eastern Christianity gave a growing importance to the anointing of various parts of the body with the “myron" consecrated by the bishop, while in the Latin Church the laying on of hands became a general one over all the candidates, with the forehead of each being anointed with oil. 2. Liturgical significance and sacramental effects. The chrism, a mixture of olive oil and balsam, is consecrated by the bishop or patriarch, and only by him, during the Chrism Mass. The anointing with holy oil of the person being confirmed is a sign of his or her consecration. “By Confirmation Christians, that is, those who are anointed, share more completely in the mission of Jesus Christ and the fullness of the Holy Spirit . . . so that their lives may give off 'the aroma of Christ' (2 Cor. 2:15). By this anointing the confirmand receives the 'mark,' the seal of the Holy Spirit" ( CCC , 1294-1295). When the sacrament is administered separately from Baptism, this anointing is preceded liturgically by the renewal of the baptismal promises and the profession of Faith by those being confirmed. “ This shows clearly that Confirmation follows on from Baptism" (CCC , 1298). In the Roman rite, the bishop extends his hands over all those being confirmed, while pronounces a prayer of invocation and supplication. Then comes the specifically sacramental rite: the “ anointing with chrism on the forehead, which is done by the laying on of the hand and through the words, Accipe signaculum doni Spiritus Sancti , 'Be sealed with the gift of the Holy Spirit.' In the Eastern Churches of Byzantine rite . . . the more significant parts of the body are anointed with myron: forehead, eyes, nose, ears, lips, chest, back, hands, and feet. Each anointing is accompanied by the formula 'the seal of the gift of the Holy Spirit'" (CCC , 1300). The ceremony concludes with the sign of peace, as a manifestation of ecclesial communion with the bishop (see CCC , 1301). As successors of the apostles, only bishops are “the original ministers of Confirmation." In the Latin rite, the ordinary minister is exclusively the bishop: a priest may confirm validly only in specific cases (baptism of adults, reception into the Catholic Church, danger of death) or when a priest has received special faculties from the bishop. In the eastern Churches, not only the bishop but also the priest is an ordinary minister, but the priest must always use chrism consecrated by the patriarch or bishop. As a sacrament of initiation, Confirmation is meant for all Christians, not just selected ones. In the Latin rite, it is conferred once the candidate has reached the age of reason; the specific age will depend on local practice, which should respect the character of initiation that Confirmation has. To receive this sacrament, a person needs previous instruction, a true intention and to be in the state of grace.